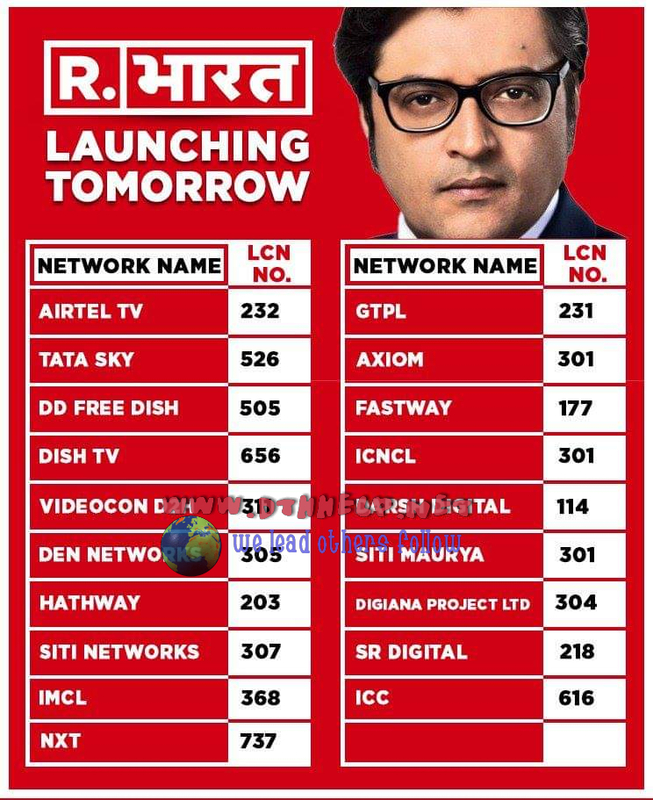 It is available on Airtel lcn 232, Tata Sky lcn 526, DD Free Dish lcn 505, Dish TV lcn 656, Videocon D2h lcn 311, Den Networks lcn 305, Hathway lcn 203, Siti Networks lcn 307, IMCL lcn 368, NXT lcn 737, GTPL lcn 231,. AXIOM lcn 301, Fastway lcn 177, ICNCL lcn 301, Darsh Digital lcn 114, Siti Maurya lcn 301, Digiana Project LTD lcn 304, SR Digital 218 & ICC 616. It is a Hindi news channel from Arnab Goswami.